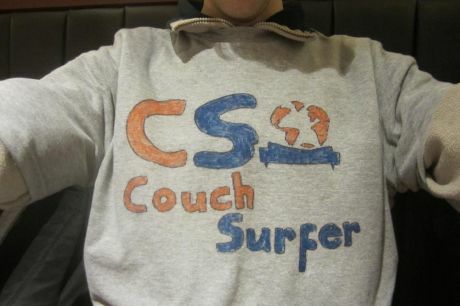 I have never took in a couchsurfer before. I met with some couchsurfers, but I didn’t actually hosted one in my house. I didn’t have the means until last year, when I updated my profile on Couchsurfing again. There was a request at some point, but I was travelling and I could not do it. Last Monday I received a request from a french girl (Julie) to host her, as she was travelling in Moldova and she wanted to come to Galati in her route to the Danube Delta. I saw this request quite late, but I replied anyway that I could do host her. This is where the story becomes complicated. She told me that she was hitch-hiking and she had problems with 4 guys that offered to help her (to take her in their car). They started hitting on her immediately, although she asked them if they were married and stuff. They were also a lot older than her (she believed that she would be ok if they were old – a big mistake). At some point I asked her for a local phone number, to make sure she is real and not some prank/fake one). She stepped out of the car, I called her because I wanted to know her whereabouts (it was late already). I checked her Couchsurfing profile, she had a lot of recent references from people that hosted her.I was becoming more and more convinced that she is real, so I made sure that she got on the right minibus that would get her to Galati. I got in my car and picked her up. She was still frightened, but she started to feel better. I took my girlfriend with me, partly because she can speak French very well, partly because I didn’t want to be there alone (there was still this little midget in my head saying that she could not be real). She was indeed as she described herself, most likely tired and scared after a long day of rejecting old, creepy men. I told her from the start that she must be crazy to hitch-hike in Romania (she was coming from the Western part of Romania). We picked up some food for her, went back to my place for a long chit-chat. I won’t put too many details here, some of them are private. The short story is that she was doing a road trip in Europe (she likes adventure a lot), with the Danube Delta as her endpoint. I hope she had good weather yesterday (it poured really hard yesterday in Galati) and that she won’t have any more troubles while hitch-hiking. I took the photo from HERE. Who’s knocking at my door? Copyright © 2019 Mihai discuta liber - The thoughts of me.